American Express has sued credit card giants Visa and Mastercard, accusing them of anti-competitive practices. The suit comes after the US Supreme Court said the two could not contest a ruling that they had wrongly stopped banks issuing rival networks' cards. 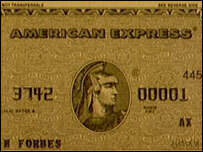 American Express said it is seeking to recover damages from lost business that could total billions of dollars. "Consumers have been damaged by the boycott by being deprived of competitive alternatives," it said. "The card associations functioned as a cartel," said American Express chief executive Kenneth Chenault. "Banks who had expressed an interest in working with us were stopped before they could start." Visa said in a statement it will vigorously fight the lawsuit, "because American Express already got what it wanted from the court - the ability to issue its products through Visa members." American Express did not specify the exact level of compensation it was seeking, only that "the number is very large". Last month, the Supreme Court upheld a ruling that Visa and Mastercard had violated antitrust law, rejecting their attempts to appeal against the decision. A lower court had found they were wrong to block US banks from issuing credit cards on rival networks such as Discover and American Express.